Wow!! Had a couple cold, windy days with a few flurries. Sunday did turn out nicer with sun and not much wind. Later in the week it’s to warm up, so that will be nice. Congratulations to Dustin, Sam and Gaige Burke on the arrival of their baby. Grayson Charles John Burke was born on the 8th, weighing in at 8 lb. 9 oz. and 20 inches long. Now the fun begins and I’m sure Gaige will be a helpful big brother. St. Vladimir’s Church has pierogies for sale. To order, call 570-928-1099. Also, on the 29th, they will be having an ethnic foods dinner, Noon to 5 p.m. at the Church Hall. This is eat-in or take out. New Albany Volunteer Fire Company held their first production of “A Fractured Christmas Carol” on Friday and Saturday. If you missed it, they will have their final production on Friday and Saturday, the 20th and 21st. This is at the New Albany Social Hall and will be at 7:30 p.m. They also have things taking place during intermission. Get out and support the Fire Company. Cold Spring is now running. I’m sure everyone will be glad to hear that. There is some landscaping that needs to be done when the ground is not so muddy. Donations to this project still being accepted and very much appreciated. 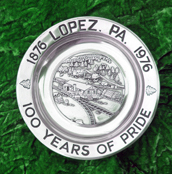 Send yours to Lopez Civic Assoc., P.O. Box 100, Lopez, PA 18628 and mark envelope “Cold Spring”. Thanks for your support. Jim and Barbara Craig, Media, spent some time at their home on Church Street. Always something to keep them busy. I guess there is still hunting going on, but haven’t heard if there have been any lucky hunters. Happy Birthday wishes go out to Jaeden Patson, 20th; Jeff Olsen, 22nd; Serenity Laird and Reese Baton, 23rd; and Cassidy Brown, 30th. Hope you all have a sunny, good day. From Mr. Neubauer’s little brown book: November 15, 1973 – Clear, warm and 52 degrees. I had 23 degrees early Sunday morning, but the sun was out really nice and it’s clear and maybe will hit 52 degrees later. Guess that’s the news for now. Enjoy your week, whatever you may do. Get out and take advantage of the warm, sunny days. There won’t be many more of them; although I did hear we are to have a mild winter. We’ll see how right they are. Have news, call me at 570-928-9238; mail me; see me; or e-mail me at uvbob@ epix.net. I’ll get it in for you. Thanks for reading and I’ll be here next time.